Heat pumps are a brilliant solution for your home, because they provide both heating and cooling, and they have SEER ratings as well as Heating Seasonal Performance Factor , known as HSPF ratings for measuring heating efficiency. The two of these amount to bigger energy savings. 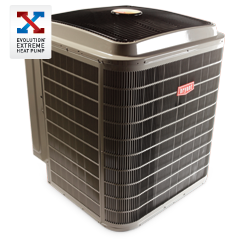 The Bryant Evolution Extreme Heat Pump offers high efficiency performance. 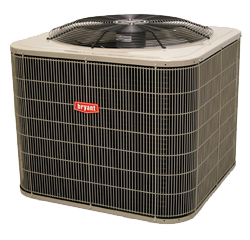 The Bryant Evolution Extreme Heat Pump offers up to 20.5 SEER cooling and up to 13 HSPF heating efficiency. Bryant is a part of UTC Climate, Controls & Security, a unit of United Technologies Corp. Efficiencies of up to 13 Heating Seasonal Performance Factor(HSPF) and up to 20.5 Seasonal Energy Efficiency Ratio(SEER). Can provide warm air to the house without the assistance of an auxiliary heat source, even when outdoor temperatures plummet. Evolution Control thermostat – delivers cooling for a year round comfort solution. When combined with an Evolution control and gas furnace or fan coil, the Bryant Evolution Extreme heat pump makes use of a variable-speed compressor to match its operation to the heating and cooling requirements of your home. The control will monitor both the inside and outside conditions and will adjust the speed and capacity of the heat pump and indoor fan motor up or down to match the desired comfort settings. It is the variable-speed technology that makes the Evolution Extreme such a highly efficient heat pump. It provides consistent indoor temperatures and you get to reduce your energy use and lower utility bills. Installing this model heat pump is easy for the contractor because it comes with features that make installation and future services easier. It requires only two communication wires from an Evolution gas furnace or fan coil to the outdoor unit for full variable-speed functionality. The control board provides enhanced diagnostics for faster service. The heat pump constantly monitors temperatures, pressures, as well as electrical information which is so critical to the system’s operation. The Evolution control adjusts the heat pump’s operational settings as needed. Contractors can also easily view detailed diagnostics and a wide range of system status information on the Evolution control screen, making service quick and easy. The new refrigerant charge assist mode helps installers ensure the system is charged correctly, based on specific configuration factors, including the indoor coil, line set diameter and line set length. Quiet operation – AeroQuiet System developed by Bryant includes a noise reduction feature in the cabinet, fan system and top for reduced sound. Sound as low as 58 dB in cooling mode and as low as 62 dB in heating mode can be expected. This unit features Puron refrigerant, which is an environmentally sound refrigerant designed not to harm the ozone layer. This refrigerant has also been approved by the US Environmental Protection Agency. This unit also features the DuraGuard Plus system which is designed to offer protection and durability to your outdoor unit. Bryant offers a 10 year parts limited warranty upon registration, unit should be registered within 90 days of purchase. Bryant is a partner of ENERGY STAR and has determined that the Evolution Extreme heat pump meets all guidelines as set out by ENERGY STAR. This heat pump offers reduced noise levels, which can be as low as 58 dB in low speed cooling and as low as 62 dB in low speed heating. Supported Controls – Evolution Control thermostat which offers straightforward prompts for ease of use. Unit Diagnostics – with the Evolution Extreme heat pump you get enhanced diagnostics with Evolution control thermostat system. This unit features Puron refrigerant, which has been approved by the US Environmental Protection Agency fir its environmentally sound design. 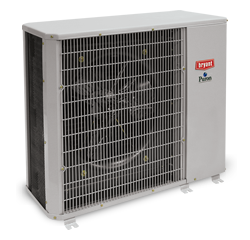 This heat pump offers a heating capacity of up to 58,500 BTUH, and a cooling capacity of up to 57,000 BTUH. The Evolution Extreme units also has a specially designed compressor that operates in a circular motion rather than the up and down piston motion. This unit is protected by DuraGuard Plus, this is a Bryant innovation that protects against harsh weather and increases durability for outdoor units. The Evolution Extreme heat pump is constructed from a solid and durable sheet metal construction and powder-coated for extra protection. Also features color matched cabinet screws. this unit also offers a DuraFlow Coil Guard Design for increased durability and efficiency. To the original owner a 10-year standard parts limited warranty; warranty period is 5 years if not registered within 90 days. Optional labor warranties which include 5-yr or 10-yr coverage options for repair labor. 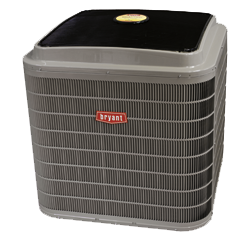 Warranties are underwritten by Bryant Heating & Cooling Systems, with no deductibles. All repair work is performed by a trusted local service technician experienced with Bryant products.